The Neue Residenz Palace or Residenz Neugebäude is located just to the opposite of the Residenz Palace′s main entrance. It was originally built in 1588 by Prince Archbishop Wolf Dietrich von Raitenau for private purposes, but also to accommodate guests. Since then, it was remodelled and redecorated on several occasions. Prince Archbishop Max Gandolf von Kuenburg extended the Residenzplatzwing around the court library (today a post office) from 1670 to 1680. 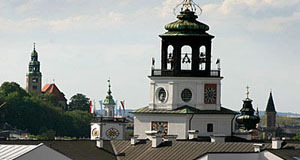 The tower extending from the western front was extended with an octagonal floor and a new roof when it was equipped with the famous "Glockenspiel" in 1701. The 35 bells of the Glockenspiel were made in Antwerp by Melchior de Haze in 1696. Prince Archbishop Johann Ernst Graf von Thun had ordered them and they were delivered and set up in 1700. However, the typical Flemish Glockenspiel technology was a bit too much for the Salzburgians back in those days, and it took until 1702 until the court clockmaker Jeremias Sauter had managed to arrange the bells correctly. In fact, he didn′t: until today, the Glockenspiel lacks the precision it actually could have. However, this insufficiency is regarded as being a characteristic of the Salzburg Glockenspiel today. You can hear the sound of the Glockenspiel daily at 7.00 a.m., 11.00 a.m. and 6.00 p.m. If you listen carefully, you will hear the "Salzburger Stier" from the Hohensalzburg Fortress right afterwards. The Residenz Neugebäude also contains halls in the second floor, that are richly decorated with stucco work from 1603 that was made by Elia Castello. These halls are used for exhibitions. Other parts of the building accommodate parts of the Salzburg federal province government and administration as well as a post office and other institutions. In 2006, the Salzburg Museum moved in and now occupies most of the building.